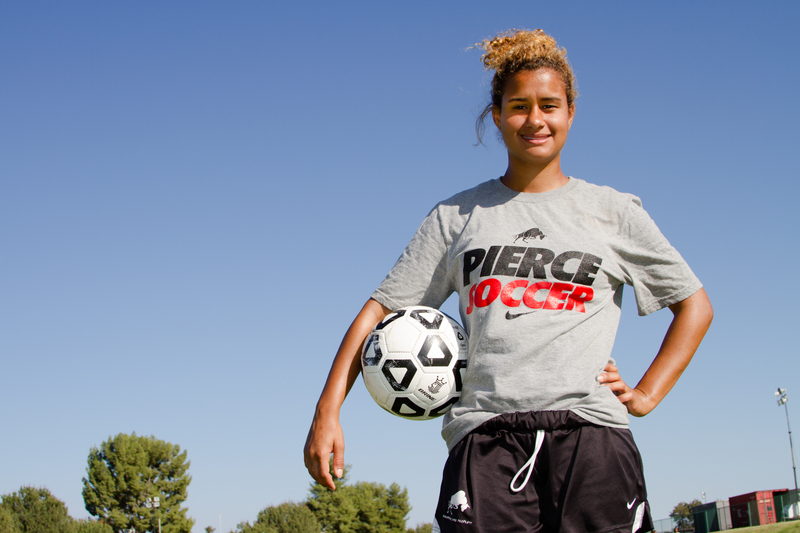 Paige Wolny striker for Pierce Women Soccer team, poses for a Photo during team practice. Wolny who live in Saudi Arabia for 10 years, is the teams’ top scorer, at Woodland Hills. Calif. on Sept 17, 2014. Photo by Erick Ceron. Paige Wolny striker for Pierce Women Soccer team, poses for a Photo during team practice. Wolny who live in Saudi Arabia for 10 years, is the teams’ top scorer, at Woodland Hills. Calif. on Sept 17, 2014. Photo by Erick Ceron. [/caption]It is one thing to carry on a love for a sport over many years, but another if that passion continues even when suitcases were repeatedly packed for a 19-year-old student. Paige Wolny, a pre-medicine major, has been playing soccer for about 15 years. She grew up in another country, where her devotion for soccer and first experiences began. “I was born in New Jersey, but I actually grew up in Saudi Arabia pretty much my entire life,” Wolny said. She lived on an American compound with people who had different cultures from all around the world. Not a day went by where she felt the need to experience new things and even after the terrorist attacks on September 11, 2001 life continued on for the young American living in the Middle East. Wolny also went to a very small school in Saudi Arabia, where everyone knew each other and built life-long relationships. She reflected on her time in Saudi Arabia and the benefits of living in a world smaller and much different world than the bustling world of the United States. Born in a family full of athletes, Wolny found herself playing a completely different sport than her family members. However, there weren’t very many girls playing soccer inside the compound. When she moved to America, she immediately realized she had to adapt to a different lifestyle. “It’s definitely a more fast paced lifestyle here. People are a lot friendlier, open, and lively,” said Wolny. Wolny went to a boarding school in Pennsylvania from sophomore to senior year in high school. Wolny then lived in Kansas for her first year of college. It wasn’t until this school year where she finally found her place at Pierce College. Playing soccer has been an important part in Wolny’s life and it has shaped her into the player she is today. “She’s an impactful player, very smart, she listens, and tries to apply anything from a teacher, which is a good positive thing for her,” coach William Diaz said. With all the struggles and hard work that come into play, Wolny still does her best to help win the games and play as a unit with her teammates. “She knows she’s getting double teamed and she knows she’s getting hit but she’s still continuing to score for us, which is great,” Diaz said. Wolny scored eight goals in eight games to start the season for the Brahmas. She is a very crafty player with tremendous footwork and ball crossing ability. Wolny’s commitment and determination every day has not only made her a better player, but has given her a chance to always feel at home.